In the year 1940 Albert Balch was 37 years old and he was at a turning point both personally and professionally. He had been married seven years and his family had expanded to four children. His father and mother had died in 1932 and 1939 respectively, so by 1940 Albert Balch had become the “elder generation” with his own children to care for. Although he and his business partner Ralph Jones had been successful in the View Ridge development in northeast Seattle and they had been able to build their own homes there, Balch wanted to do more. As Balch thought about what he would do next, he saw that just north of View Ridge there were large areas of undeveloped land. A plan formed in his mind to “build a city” on the model of colonial America. Albert Balch built his own home in 1936 in View Ridge at 6850 – 50th Ave NE (southeast corner of NE 70th Street.) Original property card photo courtesy of the Puget Sound Regional Archives. Although Balch & Jones had done well financially up to 1940, dollar signs may have been swimming before Balch’s eyes as he thought of the costs of bringing up his family. Perhaps he was looking for an even greater advance in real estate development to assure continued income. 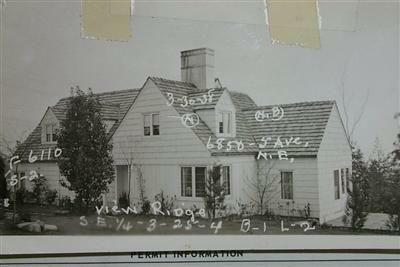 As of the census of 1940 the family of Edith and Albert Balch was living at 6850 50th Ave NE, the house in View Ridge which they built in 1936 and lived in for the rest of their lives. In Seattle the census of 1940 was taken in early April, just before the Balchs’ twin daughters Janet and Judith turned four years old and just before son Albert Balch III was born on April 26, 1940. Eldest daughter Beverly was listed as age five on the census in early April; she turned six years old just two days before the birth of her new brother. The census record of 1940 listed a live-in housekeeper in the Balch home that year. Any mother who has cared for a newborn baby plus other small children at the same time, will agree that household help is necessary! In 1940 there were no convenience products like disposable diapers or packaged meals, so in the Balch household there was all the laundry, cooking and cleaning to do plus the care of the four children. On December 8, 1939, President Franklin D. Roosevelt had declared a national emergency in response to the outbreak of war in Europe. Many people were absolutely against the involvement of the United States in the war, but President Roosevelt believed US involvement was inevitable. He used his executive powers to order a build-up of troops and war materials on the basis of defensive action, in case the USA might be attacked. Federal money was allocated for a build-up of Sand Point Naval Station for war readiness, and this led immediately to an increase in the population of northeast Seattle as military and civilian workers arrived. The jolt to the local economy was a welcome one since the Great Depression had been dragging on since 1929. War preparations created jobs in everything from military service to road-building to housing-starts in northeast Seattle near to Sand Point. On the census of 1940 Albert Balch listed his occupation as “real estate developer,” showing that he had set this as his life direction, not just as a sideline or temporary project during the 1930s. Professionally as well as personally, Balch wanted to keep going forward into higher levels of achievement. Balch anticipated that if he could get in on the improvement in the economy which had finally come, that he could make a lot of money in building houses. In 1940 Balch began searching for more property to develop, launching a separate company from that of his partnership with Ralph Jones. Throughout the 1940s the two men would continue building houses in View Ridge but Balch also branched out to do the new project in the neighborhood which became Wedgwood. As co-developer of Wedgwood, Balch took on another business partner who had also been with him in the Alpha Sigma Epsilon Fraternity at the University of Washington, Maury Setzer. At NE 81st Street, the main entrance to the first Wedgwood development, stone gateposts were set up like those of the driveway on an English manor home. 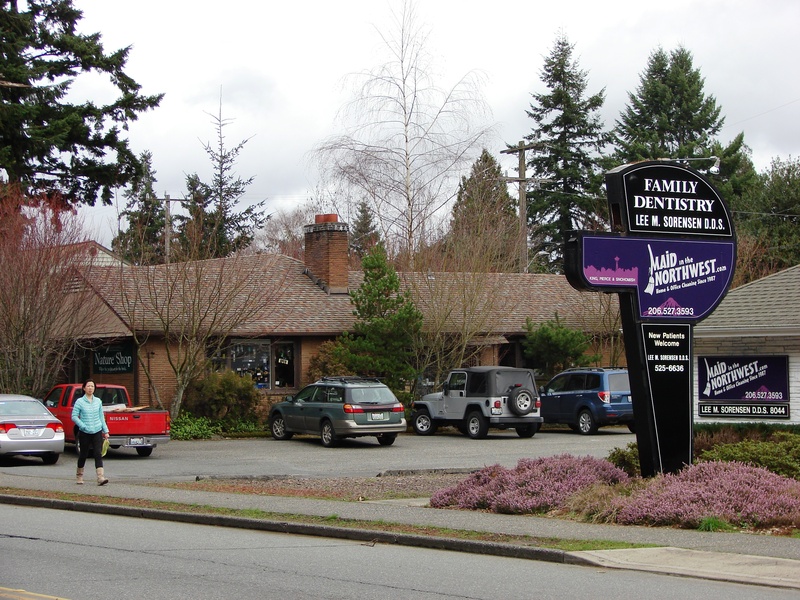 The Wedgwood Community Council refurbished the pillars and added new signs in a 1993 grant-funded project under the City of Seattle Department of Neighborhoods. By 1940 the Jesuits of Seattle University had decided not to move their school to the property which they had purchased in 1929, along 35th Ave NE between NE 80th to 85th Streets. They were still using the log cabin on the site as a chapel, and before selling the property they turned the parish over to the Dominican diocese for establishing a new church elsewhere. Balch worked out funding using some federal loans for housing for war workers, bought the Jesuit site and filed the plat of the new Wedgwood development in July 1941. Years later, when Albert Balch was interviewed about how the name Wedgwood was chosen, he told that he had given his wife Edith the privilege of naming the new development (according to an article published in the April 17, 1956 edition of the Wedgwood Community Club newsletter.) Edith Balch thought Wedgwood was a good name because it kept the syllable “wood” as an allusion to the heavily-treed nature of the tract; “Wedgwood” referred to English potterymaker Josiah Wedgwood and evoked the idea of an English estate marked by gateposts at the entry. 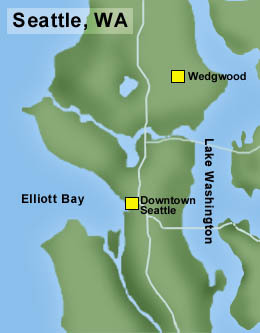 When Balch started building in 1941 the Wedgwood neighborhood was outside of the Seattle City limits. Map courtesy of HistoryLink. Seattle’s progress toward providing the additional housing made necessary by the defense program took a major step forward yesterday when Albert Balch and Maury Setzer, sponsors of the new Wedgwood residential district northeast of the city on 35th Avenue Northeast, announced that ground had been broken for the first seven homes in the 200-home project. Commitments for the first fifty of the homes under Title VI of the National Housing Act have been issued by the Seattle office of the Federal Housing Administration, paving the way for immediate construction activity, Balch said. The homes will occupy a forty-acre wooded tract bounded by East 80th and East 85th Streets, 30th Avenue Northeast and 35th Avenue Northeast. Purchased by Balch and Setzer three months ago, the area was platted in irregular blocks to permit winding streets in conformance with latest residential district planning. Homes in the district will be in the $4,500 to $5,500 price range. The tract will be improved with homes in groups of fifty, with completion of the first group set for early this fall. No two of the homes will be alike, plans for each being drawn by Thomas, Grainger & Thomas, architects, to take advantage of its particular site. Frame construction will predominate, with the general style of the homes to be of the low, rambling type. Attached garages will be included. The parklike condition in which the tract was maintained by its previous owners will be continued by Balch and Setzer, with native growth retained as part of the general landscaping scheme in the district. Maury Setzer, co-developer of the area, is a graduate of the University of Washington and of the Harvard University graduate school of business. He has been associated with the United States Securities and Exchange Commission here for four years. Balch, vice president of the Seattle Real Estate Boards and a founder of the National Home Builders Institute, is widely known here through his activities as co-developer, with Ralph Jones of the View Ridge residential district. –The Seattle Sunday Times, July 13, 1941, page 26. Because the new Wedgwood tract was completely undeveloped, streets had to be marked and built, and utilities had to be put in. It took a lot of time to do this, in addition to the building of the houses themselves. It was anticipated that some homes would be ready to live in by October 1941. The wartime preparations which had been ordered in December 1939 by President Franklin D. Roosevelt were always referred to as defense measures; that is, preparations to defend the United States in case of attack. Seattle, a coastal city with already-established airplane and ship-building centers, was one of the most important defense-preparation cities. A very large number of workers came to Seattle to join military bases and civilian support industries, so special consideration was given to housing for workers. This is the reason why the new Wedgwood development was able to get installation of city water and utilities beginning in July 1941, even though the tract was still outside of the Seattle City limits in those days. The war in Europe got worse as country after country fell before Hitler’s troops. France had been Britain’s ally and they had jointly declared war on Germany on September 3, 1939. On June 14, 1940, German troops marched into Paris and took over the country. Britain was alone, and fended off a four-month assault, called the Battle of Britain, from July to October 1940, when Hitler finally gave up plans for an invasion. After the attack on Pearl Harbor on December 7, 1941, President Roosevelt addressed the U.S. Congress and then signed a declaration of war on the Empire of Japan. On December 29, 1940, President Roosevelt’s Fireside Chat radio broadcast outlined the reasons why the US should supply Britain with war materials for their continued defense. Up until that time, many Americans were adamantly against any involvement in the war in Europe, but they were starting to see that Hitler’s forces were overrunning everything in their path. With this change of heart, in March 1941 Congress passed Roosevelt’s Lend-Lease Act which allowed for war materials to be sent overseas. This order had a direct effect upon Seattle, causing another great increase in the numbers of people working in such industries as ship and airplane-building. Even though the USA was on “war watch,” no one was prepared for December 7, 1941: the attack on Pearl Harbor which catapulted the United States into active participation in the war. All industries ramped up for production of war materials and more people than ever poured into Seattle. The number of industrial workers in Seattle doubled between 1939 to 1941 and the Seattle economy roared to life with production of everything from canned milk to airplanes for the war effort. Balch had filed his Wedgwood plat in July 1941 and the houses were built under specifications of the program of federal housing for defense-industry workers. However, the houses were not “barracks” and were not temporary, but were built with the intention of becoming a neighborhood of family homes. One early Wedgwood resident, Gerry Valaas, told me how she and her husband were only able to acquire a Wedgwood house after the original owner moved away. When new, the housing was reserved for war workers only. In his Wedgwood development many threads of Balch’s background began to knit together. As he had gained experience in the construction and development industry in View Ridge, Balch thought about what things he would do the same way, and things he would do differently. Balch & Jones had required that each View Ridge house be architect-designed as a way of insuring high-quality design, but this had resulted in houses of varying appearance. One of the chief characteristics of the original Wedgwood as organized by Balch, was the consistent scale and harmonious style of its houses. In his experience with architects in View Ridge, Balch established many long-term relationships which benefited him for years afterward. For the Wedgwood development he chose the architectural firm of Harlan Thomas & Clyde Grainger, whom he had worked with before. These architects were willing to work within the defense-housing strictures of size and cost, and they designed houses for Balch’s idea of a colonial New England-style village. By 1940 Balch had been able to visit the original John Balch house in Beverly, Massachusetts, where his ancestors had settled in 1636, and he was moved and inspired by the visit. Balch was very proud of the contributions of his ancestors to American history. He asked his architects Thomas & Grainger to use a consistent colonial theme in the Wedgwood development so as to evoke the atmosphere of a New England village like that of his ancestors. A Colonial house has an emphasized doorway with pillars and a triangular gable porch roof. The doorway is usually centered and there is often symmetry in the placement of windows. The Colonial style in architecture was defined during the USA’s one hundredth birthday celebration, the Philadelphia Centennial Exposition of 1876. For the Exposition, original Revolutionary-era houses were studied and a list of characteristics was formed. The Colonial house is usually a simple rectangle with a sharply peaked roof. The end wall of the roof forms a triangle shape called a gable. The gable form is repeated over the entrance-doorway of the house, and in dormers which are extensions of upper windows. A Colonial house will have an emphasized doorway, often surrounded with pillars and a gable porch roof. Other Revolutionary-era references on a Colonial house might be a lantern-shaped porch light (evoking Paul Revere’s ride) and an American-eagle doorknocker. The Cape Cod style is a sub-category of Colonial and is meant to look like the houses of eastern Massachusetts. The house may have shingle siding, windows divided into panes with wood muntins (or mullions) and decorative shutters, recalling the real shutters which were used in New England villages to close against the wind and rain of the seacoast. In 2000-2001 this grocery store building was remodelled for QFC. 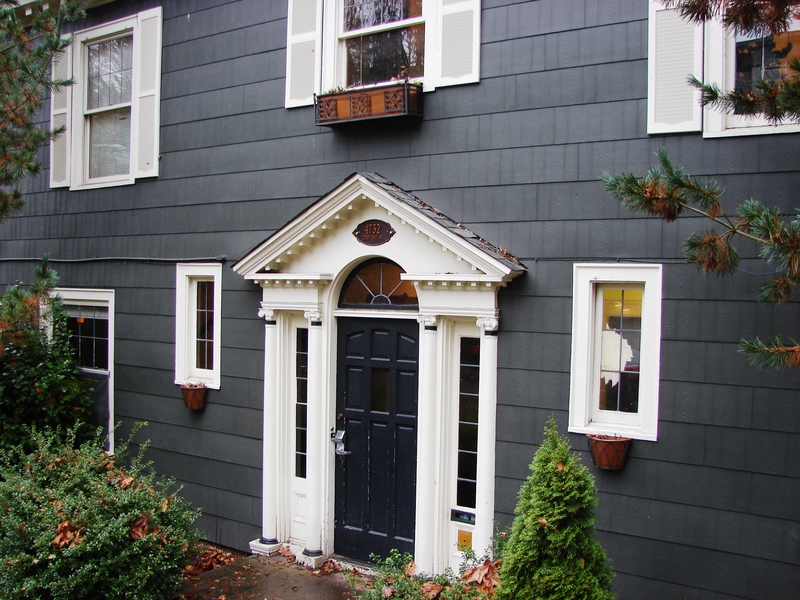 The gable front and wood siding were the requested design details evoking Wedgwood’s Colonial-style housing. Balch had no way of knowing that the USA would enter the war as a result of Pearl Harbor in December 1941, but in choosing an early-American theme for the Wedgwood development, Balch struck just the right note for the times. All American-Revolution references were considered patriotic and appropriate, and other developers copied the basic form of the Balch houses through the 1940s. From that time, the gable-form of the Wedgwood houses became embedded in Wedgwood thought as characteristic of the neighborhood. 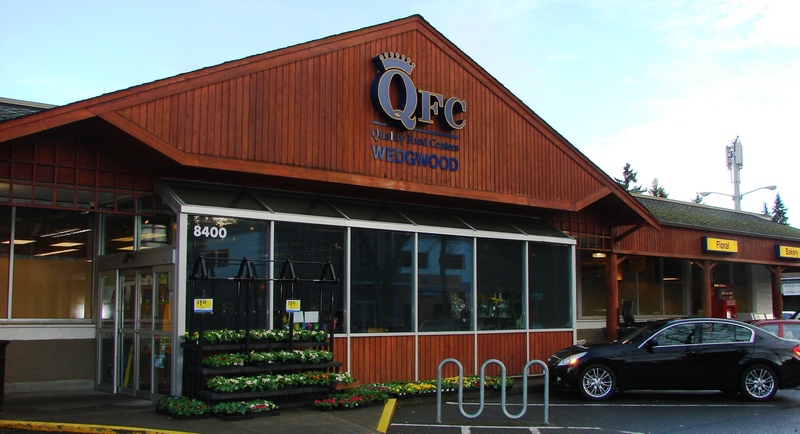 In the year 2000, when QFC took over the grocery building at 8400 35th Ave NE, QFC conferred with the Wedgwood Community Council on remodeling and updates. The question was asked, what architectural design features are characteristic of Wedgwood? Jack Robinson, then-president of the Wedgwood Community Council, referenced the Colonial and Cape Cod forms of the original Wedgwood houses, typically with a gabled roof, muntin windows, and wood siding, including shingle siding. QFC’s architect then designed the remodeled front gable and wood siding for the store. 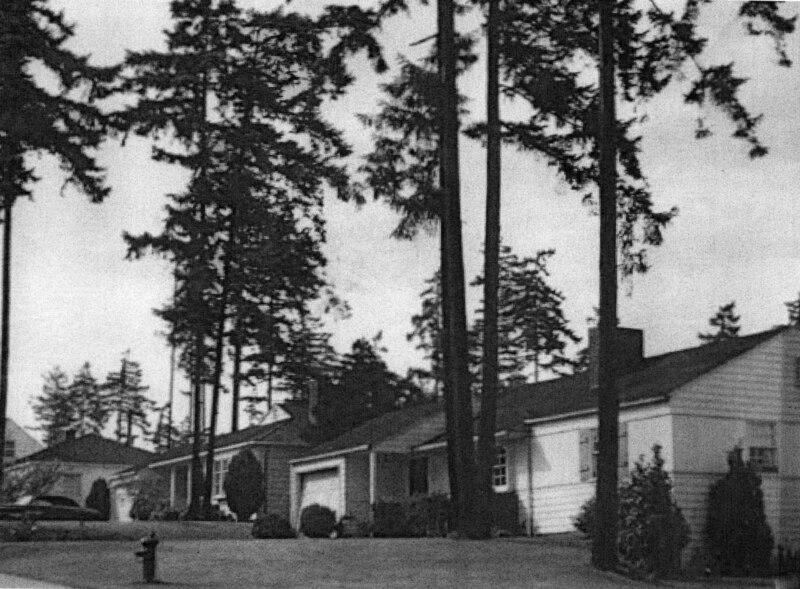 A 1953 view of NE 81st Street in the original Wedgwood development, emphasized its natural setting in tall trees. Photo by Werner Lenggenhager in the Seattle Public Library Historic Photos Collection. The View Ridge development was on an eastward slope toward Lake Washington, and Balch & Jones had cut down most of the trees so as to expose the views of the lake and the mountains on the horizon. In Wedgwood, one of the advertised features was that the trees had NOT been cut down. Instead of the bare, scraped-earth appearance of an all-new development, the tall Douglas fir trees of Wedgwood gave the neighborhood a finished look and a sense of being nestled in a natural environment. The Wedgwood development had “consistency of scale,” in that most of the houses were the same height and about the same size, and had the same set-back on the lot. The variation in forms and design details helped keep the houses from looking too much the same. In his 1953 view of Wedgwood (above) photographer Werner Lenggenhager described the look of the neighborhood as “harmonious.” This first Wedgwood development was completely finished with sidewalks, curbs, and streetlights, and there was a prohibition (written into the deed covenants) against putting in fences along the front of the lot, although backyards could be fenced. The lack of front-yard fences, the easily-accessed-front-door style of the houses and the finished look of sidewalks and streets gave Wedgwood an open, approachable atmosphere. Balch’s engineering surveyors curved the streets of Wedgwood along the natural slight slope toward 35th Ave NE. Balch and the surveyors who platted the development probably intended that the curving streets would help with rainwater runoff. We don’t know if they considered other impacts, but it is true that the curving of streets does help to slow car traffic. Curving, winding streets also soften the aspect of the neighborhood layout and lend a sense of intrigue, wondering what is “up ahead around the corner.” The charm of the Wedgwood development was observed in awards which Balch received and recognition in architectural journals. The Seattle Audubon building at 8050 35th Ave NE is the original Albert Balch office of the Wedgwood Corporation. Balch later expanded into the building at right with a sign for the real estate arm of his corporation, Crawford & Conover. Balch’s Wedgwood project set the course of the rest of his life. After the experience of building the original Wedgwood in 1941-1944 he was able to go on and do more plats on nearby undeveloped land. Balch was fulfilling his early aspirations as stated in his high school valedictory address on “How to Build a City.” His expertise, reliability and reputation as a builder helped create so many projects that finally the entire neighborhood took on its identity from the Balch houses, and called itself Wedgwood. In January 1949 Balch moved his office from View Ridge to Wedgwood (today’s Seattle Audubon Society building at 8050 35th Ave NE.) Balch’s real estate and development work emanated out from this office for the rest of his career. Continued: Albert Balch, Part Five: Spreading Wedgwood Everywhere. 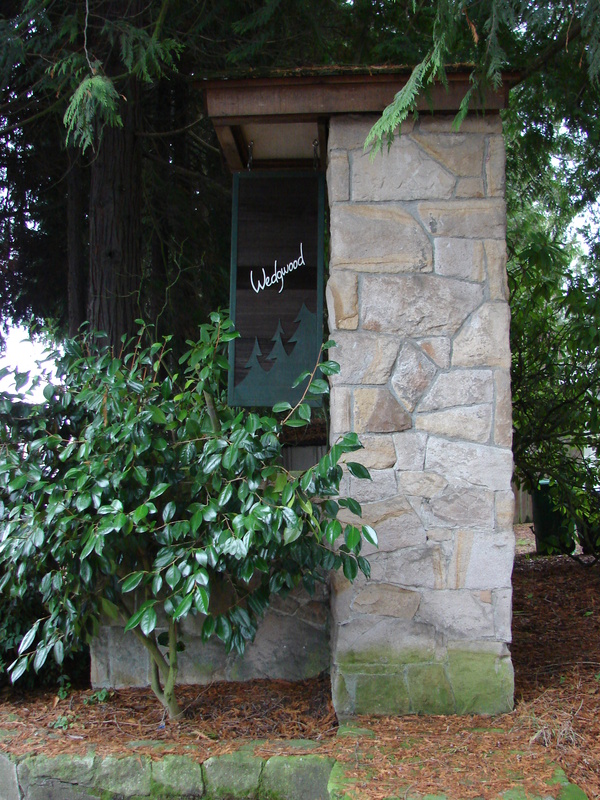 This entry was posted in Architecture, Balch and tagged 1940s in Wedgwood, developer of Wedgwood, Seattle, WPLongform. Bookmark the permalink.